C Pose guy paper doll week continues today with a pirate paper doll outfit. There are themes I tend to come back to a lot- cyberpunk, post-apocalyptic, contemporary fashion, medieval inspired fantasy, and steampunk, of course. And then there are themes I like, but I don’t seem to feel the same connection too. Pirates are firmly in this category. I love a good pirate movie and I’m all for swashbuckling and adventure, but I tend to not go back to pirates with the same regularity as I do some other themes. 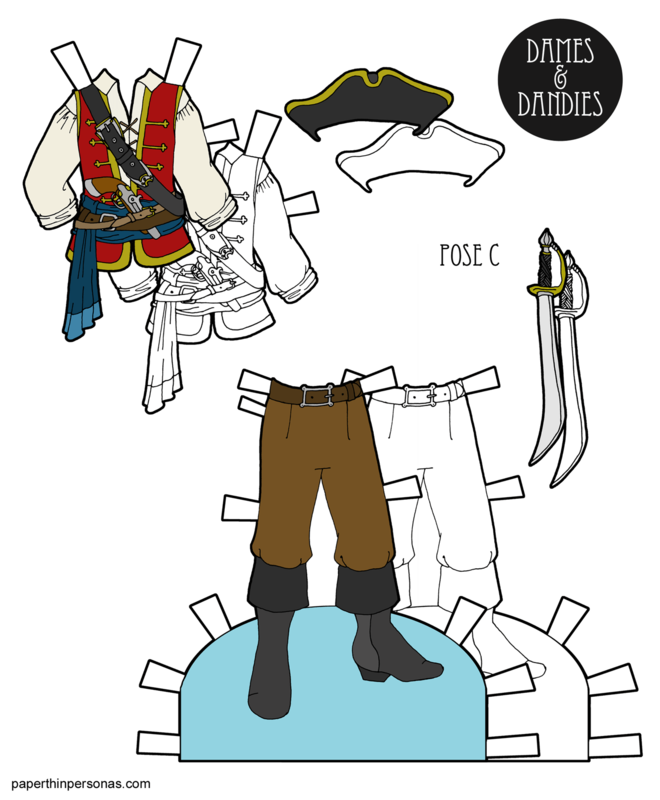 A bunch of illustrations on Pinterest inspired today’s pirate paper doll. You can make sub-boards and you can see my Pirate board which is a sub-board of my Fantasy Clothing board. This image was a specific inspiration, but I also looked at lots of photos of flint lock pistols. They are hard to draw. When working on pirate paper doll clothing I tend to think in layers. I imagine pirate outfits as sort of pieced together from different items that don’t totally match. Plus, I try to give at least a nod to the 18th century when pirates sailed the high seas. Of course, there’s no scurvy in my paper doll universe and it’s generally a much cleaner time period. Being an actual pirate, I suspect, would be a rather horrible existence, but the fantasy Hollywood version is very romantic. There’s boats and freedom and swords, after all. If you’d like to see more of my pirate creations, I have a whole tag devoted to pirates, some of which are space pirates. So, my question to all of you is, do the ladies need pirate outfits too? Let me know in a comment. Yes! I’m sure Mary Read was, in real life, wore grubby men’s clothes (likely blood-splattered) but I like to think of her in a spiffy lady pirate outfit.